When I saw this in our monthly Stampin' Success magazine (it's the magazine they send demonstrators each month), I had to recreate it!! I LOVE the idea of gluing an envelope shut and punching one end open with a border punch -- brilliant!! 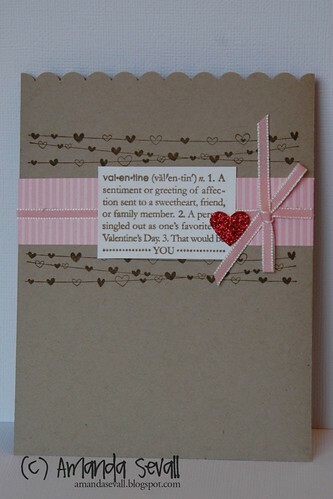 Perfect for holding a small gift, gift card, a love note or some candy!! Oh my gosh Amanda this is sooo cute! I just love the sparkly little heart. It adds such a pop of color to the card. Love it! Your card is very pretty - nicely designed! Now following from SC. I'm following you via SC # 277 ...please stop by my blog and follow me as well. Thanks! Love this! I am also in love with your blog design! Cute cards and cute blog. I'm following you via SC #344 on the list. This is so beautiful and unique! Beautiful work! Thanks so much for the sweet comment you left on my blog. Hi Amanda! I like several of your projects so I chose you for the Stylish Blogger Award. You can see what to do at my blog at www.stampwithtammyb.blogspot.com.